• The firm won this year’s Excellence in Historic Preservation award from AIA Baltimore and a Good Design=Good Business Award and Honor Award from AIA Central PA.
• Murphy & Dittenhafer Architects has now received a total of 108 Design Excellence Awards from the American Institute of Architects and 210 total awards inclusive of Historic Preservation and Construction Craftsmanship. Two Murphy & Dittenhafer Architects projects were recently recognized by the American Institute of Architects for their contributions to architectural design and community engagement. The Seminary Ridge Museum in Gettysburg, Pennsylvania, received an award from AIA Baltimore for Excellence in Historic Preservation. The South Cumberland Library in Allegany County, Maryland, received an Honor Award and a Good Design=Good Business Award from AIA Central PA.
Frank Dittenhafer II, FAIA, LEED AP, President of Murphy & Dittenhafer Architects, says he’s proud of both honors but of the Good Design=Good Business nod, especially, which is the eighth of these awards his firm has won over the years. Over the past 31 years, Murphy & Dittenhafer Architects has been recognized for design excellence more than any other architectural firm in central Pennsylvania. This recognition marks 26 consecutive years where at least one M&D project (and many years where two or three projects) has been identified by an award jury to receive a design award. Including 2018, the firm has now received a total of 108 Design Excellence Awards from the American Institute of Architects and 210 total awards inclusive of Historic Preservation and Construction Craftsmanship. Learn more about the two projects below. 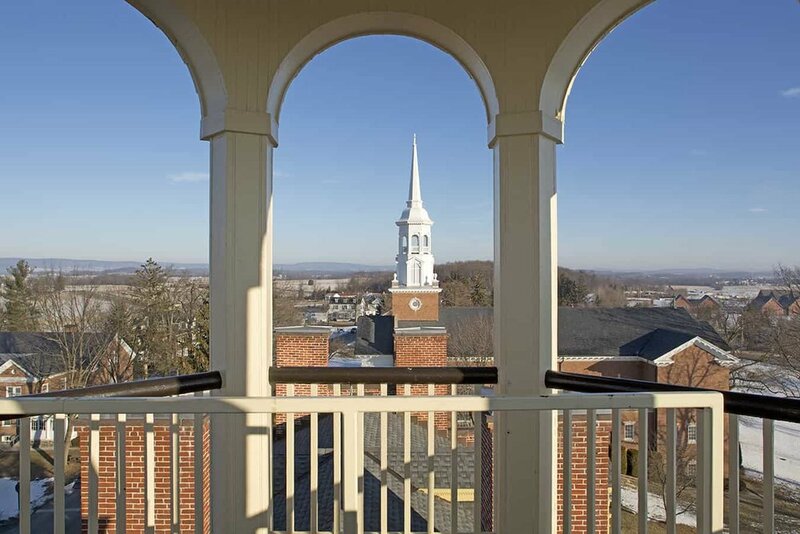 About the project: Murphy & Dittenhafer Architects had the challenge of preserving as much of the historic original Gettysburg Lutheran Theological Seminary Building as possible, while creating a museum to compete for 21st century tourists with numerous other attractions in the area. This is the fifth AIA Baltimore Trostel historic preservation award for M&D. Workers dug with spoons and trowels to make sure artifacts underground were preserved. Architect Bruce Johnson notes the building’s original windows were kept, and interior storm widows that were added had to be cut onsite to fit the exact openings of the existing windows, many of which were askew as the building had shifted over time. The firm also pulled down plaster ceilings to configure the HVAC ducting system in the joist spaces, then put these ceilings back in place following the contours of the building, meaning it is not level in many places due to the building’s having settled. “Visitors can see this from the right spot on the stairs,” Johnson says. He also relates that some interior walls had to be removed to allow proper circulation of museum visitors, but the floor is painted different colors to allow visitors to see where walls had been. M&D used rough sawn boards from the building and Gettysburg granite for the ticket desk. He says M&D didn’t try to hide needed modern additions, such as the new public entrance tucked in under a rebuilt 18th century porch, but to make these interventions tastefully. Preserving the history is especially important to Johnson, whose father was a high school history teacher, and who spent many summer days in Gettysburg growing up. “It’s important to retain that historic fabric but also be able to present and re-utilize the building to tell the story to current and future generations,” Johnson says. “You can still go to the cupola where a union general saw the confederate troops advancing from the west. You can experience where you are,” Dittenhafer says. 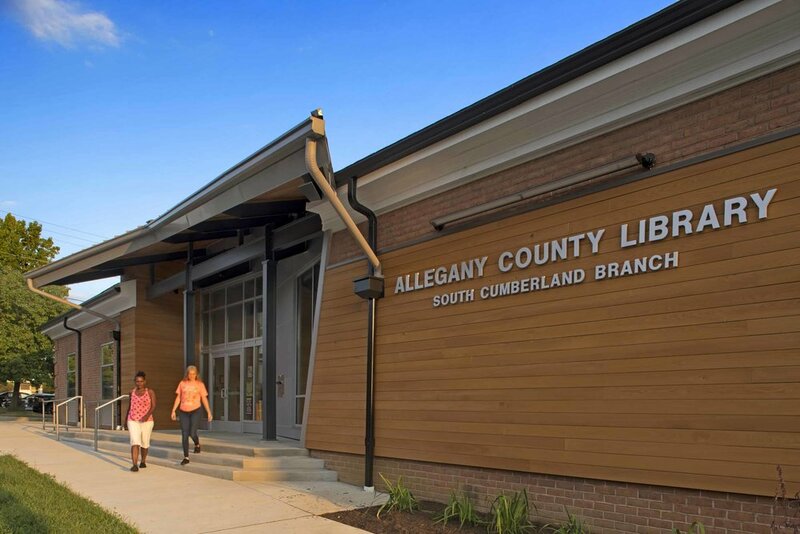 Award: Honor Award and Good Design=Good Business Awards from AIA Central PA.
About the project: The South Cumberland Library is the Allegany County Library System’s largest branch, serving a blue-collar community of around 9,000. But, the building had been unchanged since being built 35 years ago, and had lost its appeal to the residents. The building’s structure, roof, and exterior brick walls were in good condition, so the job was to make the interior inviting. 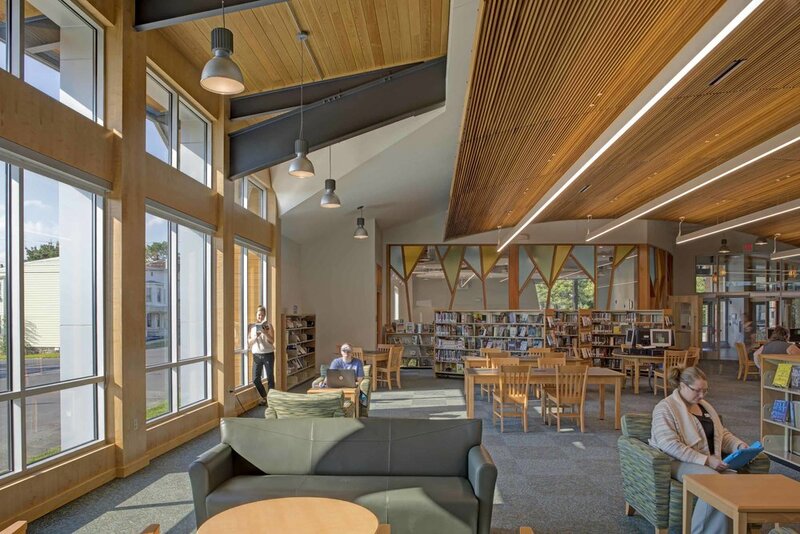 “A main focus was to re-engage the library with the surrounding neighborhood,” Ness says. 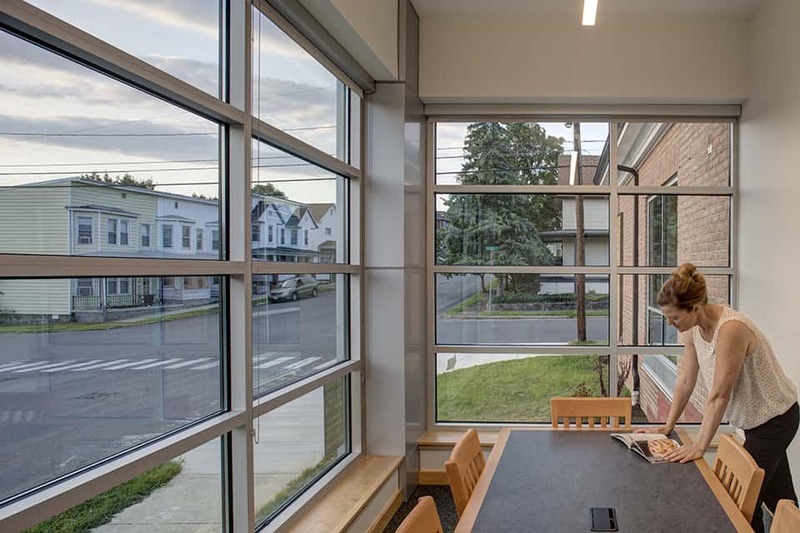 The firm added a new, larger glass storefront entrance and window bays in the existing brick walls, looking directly onto the residential neighborhood across the street. The new windows and entrance also bring in an abundance of natural light, a recurring theme in M&D designs. “The entire building has become more transparent and feels more connected to the community. Readers can take advantage of the light and views of the surrounding neighborhood,” Ness adds. Inside, partitions were removed and replaced with an open floor plan. “We now have cloud-like ceilings and tree-like wood framed windows in the children’s room,” says Ness. Dittenhafer says the community’s response is what counts, not winning the awards. “We gave it a warm feeling, a place you want to come and spend time, not just get your stuff and leave. 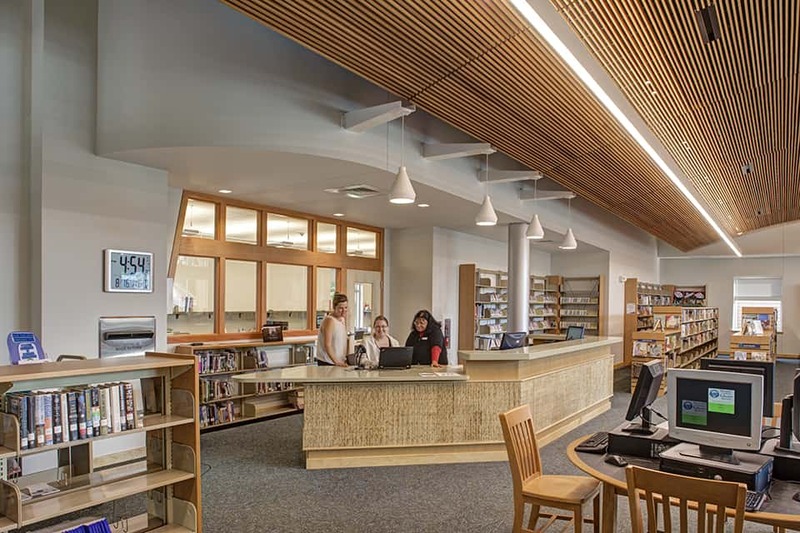 Users have increased greatly since this re-design, fulfilling a library’s purpose today—serving as a community center for children, families, seniors, community groups,” Dittenhafer says. He believes the project is successful in all aspects of engaging the community. Jury comments: Significant community-oriented, adaptive re-use of an existing building with an attention to detail and structure. Dramatic/complete transformation. The reading room is very special and has a special relationship with the surrounding neighborhood as a community gather space.